Last Sunday while Mom was out at the craft show I was home taking care of the kids. Watching two kids can be tiring work, for both Jake and myself. 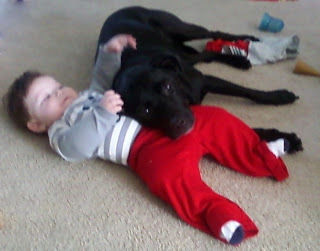 Coming from the kitchen I round the corner to see Jake taking a breather using Luke as a pillow. Jake seemed to be enjoying the pets from Baby Luke.